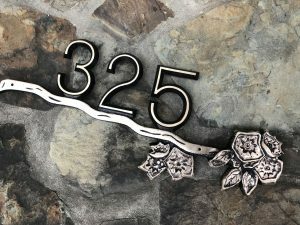 Mountain Laurel Address Plaque | K Castings, Inc. Designed on location in our pattern shop and cast in our foundry, “From Concept To Finish At One Location”. With attention to detail and craftsmanship at the forefront, we are recognized for manufacturing the highest quality products in the industry. The Laurel Series premiering with the Mountain Laurel Branch is inspired by the beautiful Laurel Highlands of Western Pennsylvania. The Mountain Laurel bloom in the Spring and has forever been my favorite flower. 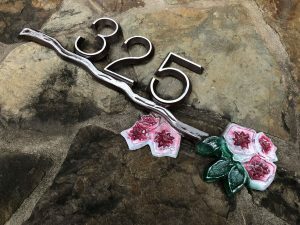 The Mountain Laurel Branch Address Plaques feature a one of a kind Laurel branch design. The branch design sits 1/4″ off the mounting surface. The 1/4″ design feature of the branch also allows for installation on multiple surface types. The numbers are offset “reasonably to the right” (numbers are centered if requested or for five number orders). 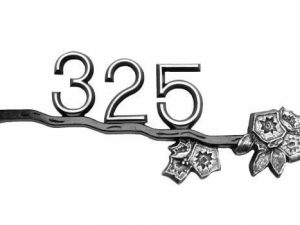 The Mountain Laurel Branch is finished in our signature pure brass reveal allowing the numbers to be seen from greater distances. 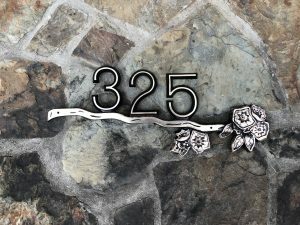 The plaques are cast solid from pure authentic brass, are extra thick boasting a three-dimensional view, are durable, and are naturally rust-free.